A delicious combination of crunchy, tangy and a little sweet. This Top Ramen Asian Chicken Salad is perfect for a quick weeknight dinner or a group gathering. If you didn't have top ramen by the cases when you were in college, I don't know what kind of living you had, but you got cheated. In college, I had a healthy combination of the “good life” and top ramen meals in college. And if I am being perfectly honest, I have to tell you that my momma actually use to meet me on the highway halfway to bring me Sunday dinner. I was only 45 minutes away, and I won't deny the fact that I may have been (and still am) a little spoiled. Top Ramen is a college tradition right in line with parties, hanging out in the student union, and finals week. They are part of many-a-care-packages sent to college students around the nation. You might think you graduated from top ramen when your college days ended and you landed your “grown-up job”. And if that is your preference, then, by all means, I ain't mad at you. But what I will tell you is that you are missing out!! 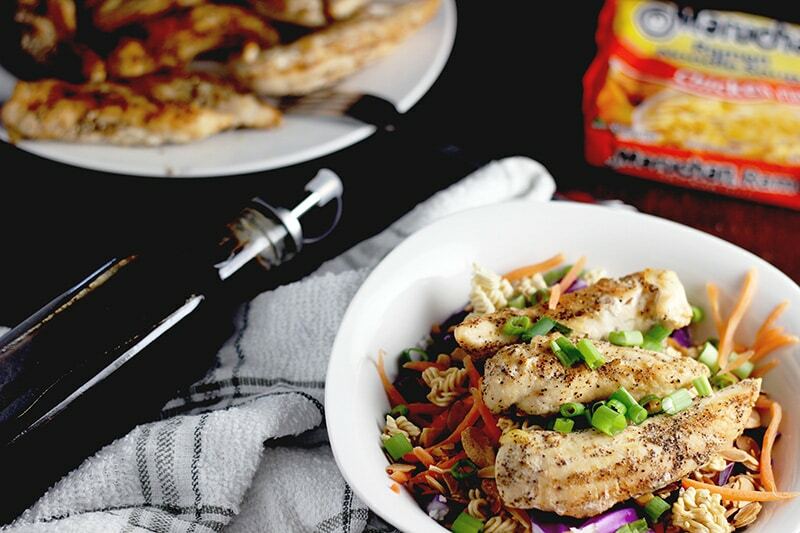 This Top Ramen Asian Chicken Salad is not to be slept on guys. It is so darn good! Y'all know I love a quick, easily thrown together meal. And this is one right here! Perfect any time of the year, this salad never disappoints. Start by preheating your oven. 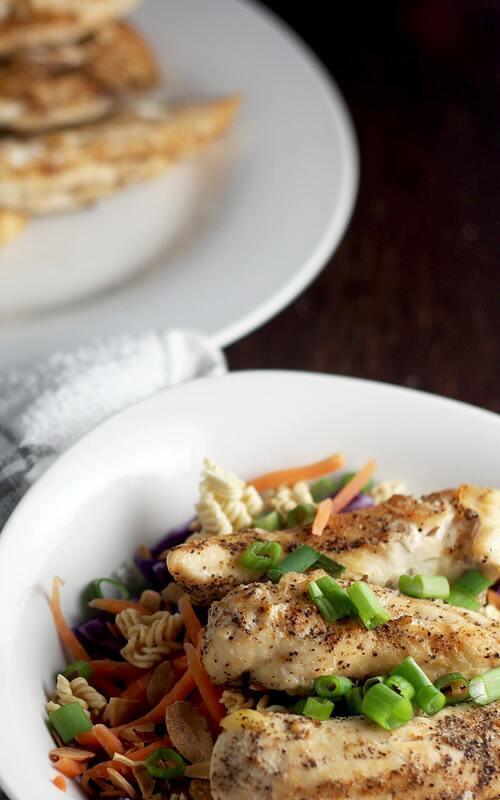 You can cook your chicken in a skillet, the oven or like me. Since getting my NuWave oven, it has become so easy. 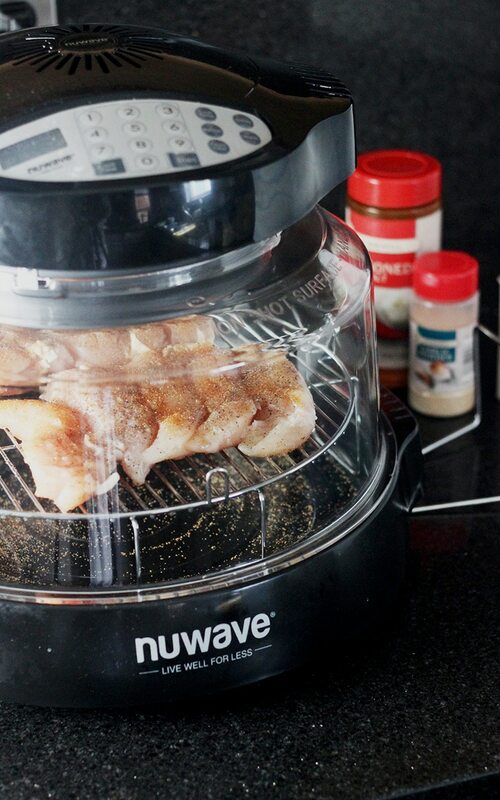 With the NuWave oven, you can put frozen meat in it, and it still comes out juicy, tender and delicious. 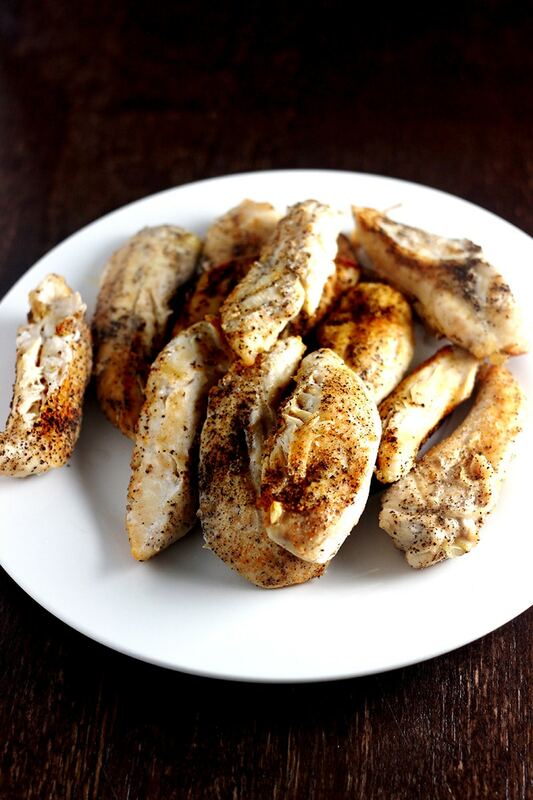 For this recipe, the chicken only took 20 minutes to cook! 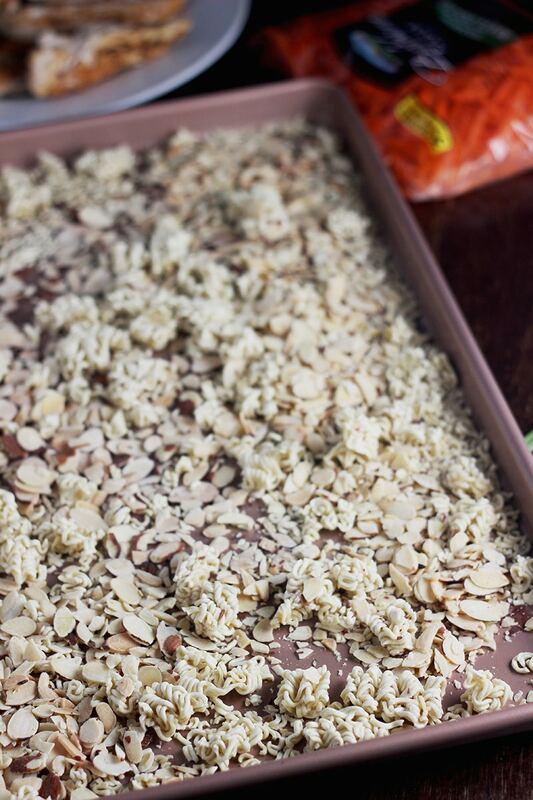 On a sheet pan, crumble the ramen noodles into small pieces and add the almonds. Spread them evenly across the pan to ensure they cook evenly. The cabbage combined with the ramen and almonds adds a crunchy goodness that makes the salad texture AMAZINGLY CRUNCHY! Bake the ramen and almonds until they are golden. Roughly about 7 minutes, but watch it because it will vary by oven. Toss halfway through baking. Again, just to make sure it bakes evenly. Remove from the oven and set them aside. Shred or chop the cabbage into small pieces. For the cabbage, you can choose to chop it by hand or to use a food processor. 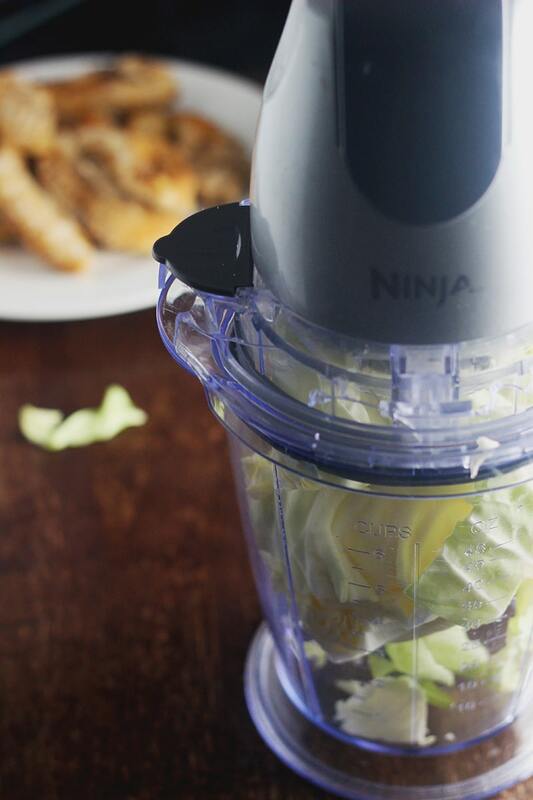 I personally like shredding cabbage with my Ninja Bullet. 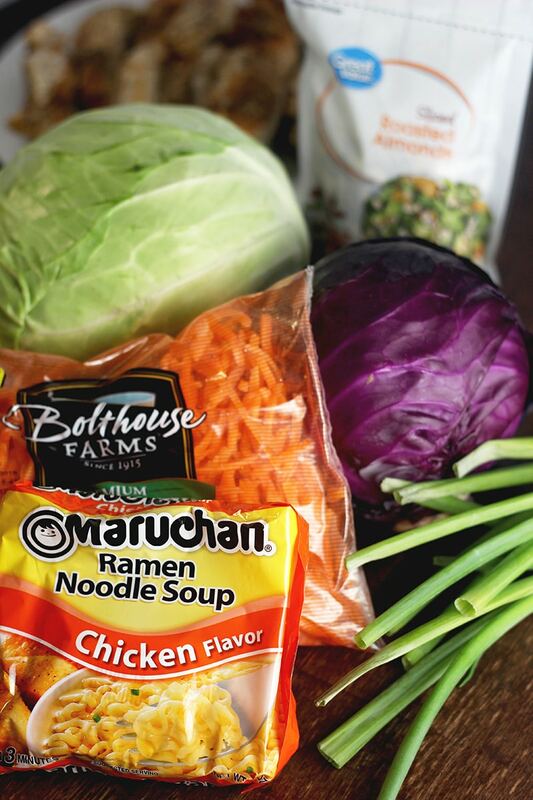 In a large bowl combine cabbage, carrots, green onions, chicken, ramen and almonds. For the dressing, in a mixing bowl whisk together all of the dressing ingredients until blended. Drizzle the dressing over the top and toss the salad to evenly coat. 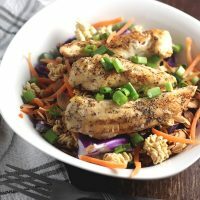 Outside of the chicken, there are minimal ingredients, so this is definitely one of those meals you can throw together in thirty minutes. And the delicious dressing?? all of the YES in the history of yeses!!!! A delicious combination of crunchy, tangy and a little sweet. Perfect for a quick weeknight dinner or a group gathering. For crunchy salad, don't add dressing until you are ready to serve.Alternatively you can also, keep all ingredients seperate and add per serving rather than mixing everything together. 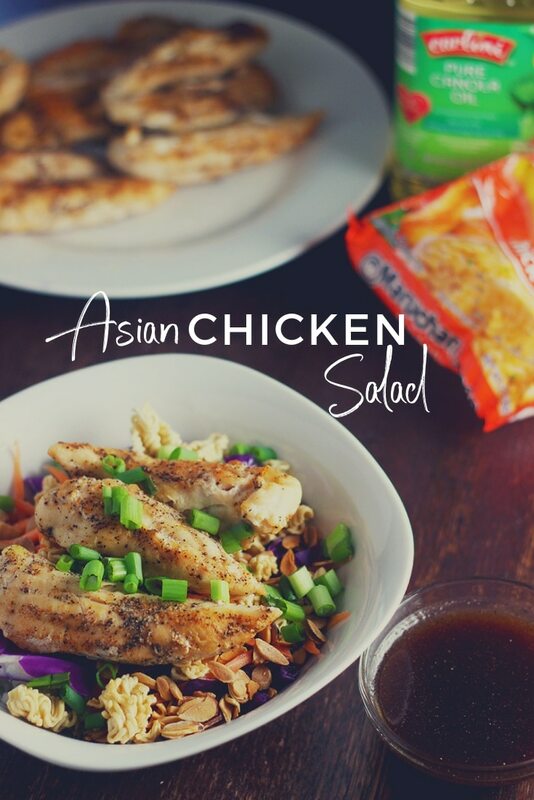 INTERESTED IN MAKING TOP RAMEN ASIAN CHICKEN SALAD? YOU CAN PIN IT AND SAVE IT FOR LATER WHEN YOU ARE READY TO MAKE IT! Editor's note: This recipe was originally posted on February 8, 2018.